SAMANA CAY — On a barren speck of land poking out of the sea, I met a scraggly group of iguanas in need of a Club Med vacation. From every direction, the scaly, cat-sized lizards scurried toward us. They dodged from cactus bush to craggy slab, stopping every few steps to bob their heads up and down. When I tossed pebbles toward them, they'd creep even closer before bobbing their heads again. Pretty soon, I was crouching face to face with the mini-dinosaurs, admiring their red, green, yellow, and orange hues. It would have been easy to reach out and grab one. And that's the problem. Bahamian rock iguanas are so easy to catch that all eight species are endangered, mostly at the mercy of stray cats and dogs that like to eat them. But iguanas made their way here long before cats, dogs, or even Columbus came to the Bahamas. Some crossed ice bridges from South America during the last Ice Age. Hurricanes and storms blew others from island to island. Over the course of thousands of years of isolation from each other, different subspecies of iguana have developed distinct looks and habits. Head bobbing is one example: Each iguana group has its own bobbing rhythm for attracting mates. When Columbus arrived in the New World, thousands of iguanas lived throughout the islands, including today's San Salvador. In fact, we inherited the word "iguana" from the Taino word "jiguana." Lucayan Indians used to eat the reptiles, and some people still do. Columbus describes iguanas only once in his log, when he got to Crooked Island. He had never seen the animals before, and he thought they were long serpents. On October 16, he also wrote: "I saw no animals of any kind except parrots and lizards. A boy told me he saw a large snake." Some of those reptiles could have been iguanas. Today, the most endangered species of iguana thrive only inout-of-the way places and on deserted islands like Green Cay, where we visited the friendly creatures last week. Fewer than 600 San Salvador iguanas remain. Half of those live on Green Cay. I was able to learn more about the plight of San Salvador's iguanas on Friday, when experts Bill Hayes and Ron Carter flew in from Loma Linda University in California to check up on the animals. Bill and Ron have been coming here twice a year for almost a decade. About ten years ago, Bill told me, the Club Med resort on San Salvador began taking tour groups to Green Cay to see the iguanas and feed them apples and oranges. So, when the iguanas see people, they think food is coming. Without permission, the resort also snagged a handful of animals and brought them back to San Salvador. 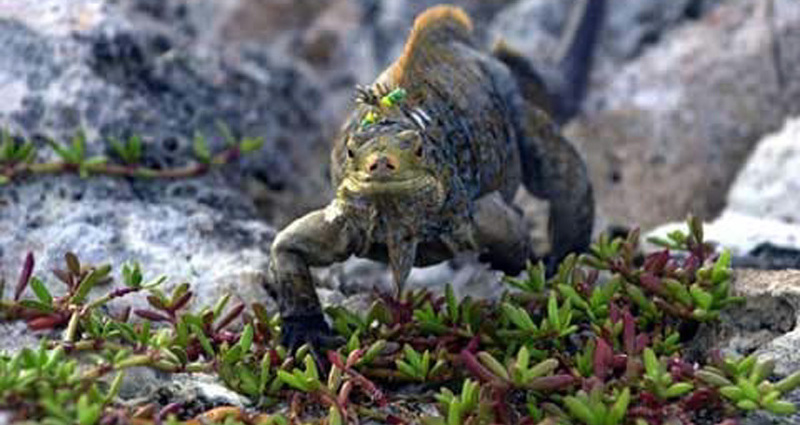 An estimated fifteen iguanas now live at Club Med, and many still wear the beads the researchers use to mark them. “Our initial feeling was that this is terrible," Bill told me, as we drove to the Club Med site to see if we could locate some of the transplants. But their research has turned up some interesting surprises. Ron has recent video footage of an iguana mom eating one of her newly hatched babies on Green Cay, suggesting the animals aren't getting enough to eat on the little island. It also looks like the animals at Club Med are a lot fatter and healthier than the animals on Green Cay. Last year, baby iguanas were born at Club Med for the first time, Bill said. "Now that they're reproducing, we want to compare them with the Green Cay population," he said. "We're starting to see that maybe it's not such a bad idea to put them in a resort environment." Soon after we got to Club Med, we came across an iguana on one of the resort's manicured pathways. It wasn't "Big Red," the researchers' favorite iguana, but they were impressed. "Ron, look how fat he is!" Bill said, as he tossed the iguana an apple chunk. "He is so fat compared to what we see out there on Green Cay." I spent the rest of the afternoon running around Club Med's sculpted grounds and pastel buildings with Bill and Ron, to no avail. We saw tail tracks in the sand between bunkhouses, but we didn't see any more iguanas. Looking around at the lush gardens and shady hiding places, I realized that the researchers might be on to something. Life would surely be more comfortable in the confines of an expensive resort than on an exposed, scruffy island—even for an iguana. For Dr. Hayes, the issue is simpler: "We just don't want them to go extinct."